Dublin Meadows is home to seven Setters: six Irish Setters, and one Gordon Setter. We are located in Norco, California which is in Southern California. 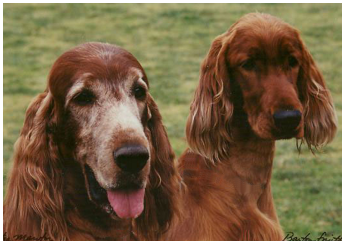 Whether you own Irish setters or just love the breed, feel free to visit the site for information and lots of photos. I think it is important to assess what each dog enjoys doing and is skilled to do. With that in mind, my dogs are exposed to different venues and opportunities-some conformation and others performance-oriented.